My town has been blessed to have a lovely library. The doors to our local library opened on August 15, 1894, with five thousand volumes. Today's library building is double the size of the original, housing one hundred seventy thousand items including books, magazines, CDs and videos. I've spent a lot of time in this library and others over the years. As a child, I was a voracious reader, what you would call a bookworm. Reading was my favorite past time and I was easily lost in the world between of the covers of my books. In college, I adored the library. I loved the quiet corners where I could escape the craziness of campus days and nights. The library was where I studied and learned. I loved sitting in the stacks for hours at a time conducting research for term papers. I was in awe of the knowledge contained within the four walls of the library building. As I think back over the past ten to twenty years I don't think I have been in a library, other than to renew my library card. Once my sons no longer wanted me tagging along with them on their trips to the library I no longer went. I was a working mom and the library wasn't open when I was available. Instead of borrowing from the library I began to buy my books and was thrilled with the convenience of being able to order them online. Fast forward to today. My local library held its annual book sale last week. This is an important fundraiser for the library. 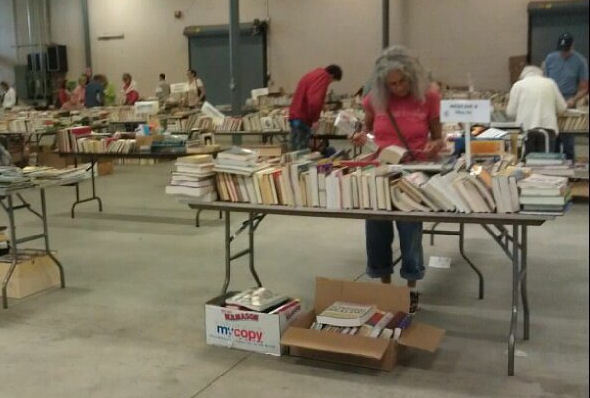 Held over a four-day span, the book sale is usually well attended. It's been a few years since I attended, so I decided to go this year. I admit I went reluctantly. I've been using a digital reader to read books for about eighteen months. Most of the books I read are free, downloaded from the online library association to which my local library belongs. I also have a Kindle app on my smartphone, and I occasionally read books on it. My reluctance in attending the book fair was due to my lack of desire to buy physical books. I have two bookcases filled with books at home. I don't know why. Once anyone in my family reads a book we rarely touch it again. These books are just taking up space and gathering dust, although I must admit they add to the homey feel of the room. The thought of books as dust catchers was on my mind as I wandered through the many tables at the book sale piled with other people's cast-off books. Another deterrent was the smell. As I walked among the books I could smell that mustiness that books take on as they age. Did I want to bring that smell into my home? Would it just mean that I would have to buy more air fresheners? I watched other people carefully perusing the piles of books, filling bags and boxes with their choices. The prices were right. Most books were fifty cents or less, making it possible to gather a year's worth of reading for very little money. I left without making a purchase, after deciding I just didn't want to add to more book clutter at home. So what does this mean? Have I given up on physical books? Don't hate me, but I think I have. I love the ease of access to books through digital tools. I love the ability to carry many books with me on one small device. I like the ability to peruse many reading options online from home in my robe and slippers. I've come to realize it's not the actual physical books I love, but the words and imagery created by the authors. Are you like me? 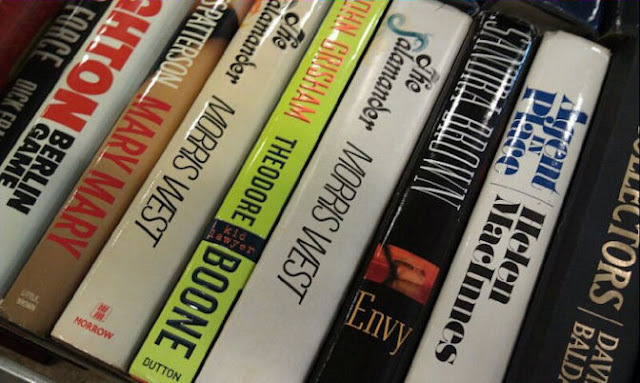 Are you starting to favor digital books over the old fashioned, bound variety? Will libraries go the way of the dinosaur? Perhaps they will. To me it seems the writing is on the wall. Our library also holds book sales to raise funds, and whenever I drop off a bag of books for the sale, I include a check to cover the purchase I won't be making at the sale. I don't want to acquire more books -- my husband and I both hoard books, so we have hundreds -- but I still want to help the library. The sales get me to cull through my bookcases and pull books for donation, too. That's as great way to continue to support our local libraries.